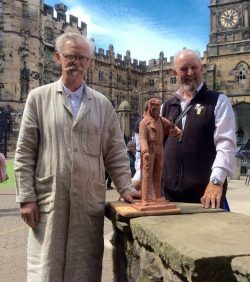 Sculptor, letter carver and teacher Alan Ward has completed a life-sized bronze of Sir Peter Hesketh Fleetwood at his workshop and teaching rooms at Lancaster Castle. Commissioned to sculpt the commemorative figure by Fleetwood Civic Society, Fleetwood Museum and the local Rotary Club, Alan worked on the piece for six months, carefully carving a miniature maquette in clay before starting on his full-sized model ready for casting. 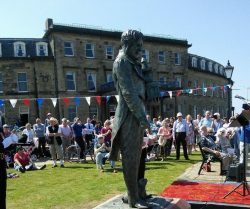 The completed bronze, which is the town’s first ever commemorative statue of the man who was passionate about establishing Fleetwood as a desirable seaside destination on the Fylde Coast, was unveiled by Lancashire High Sheriff Tony Attard earlier this month and is now established in its permanent home in Euston Gardens. Alan has been based at Lancaster Castle since 2016 where he runs a series of workshops and courses, including stone carving, life drawing, clay modelling and calligraphy. Visitors are encouraged to view his work, which includes a broad range of private and public commissions, as well as that of his students when visiting the Castle. For information on classes currently available at Lancaster Castle, please visit contact Alan directly at: sculptureaward@yahoo.co.uk.